Three has gained increased attention lately as its latest advertising campaign went viral. #SingItKitty, which features a girl and moustachioed cat lip-syncing to ‘We Built this City’ whilst cycling around a suburban cul-de-sac, has had over 5 million hits on YouTube since launching on 21st February. The advertisement encourages people to enjoy the ‘silly things’ in life, and follows on from the success of last year’s #DancePonyDance campaign. Dial Testing by YouGov shows that 73% of people liked the new advert. However, the results also suggest that last year’s #Danceponydance advert commanded a greater level of viewer engagement (between 2-5% more) than the #Singitkitty advert. 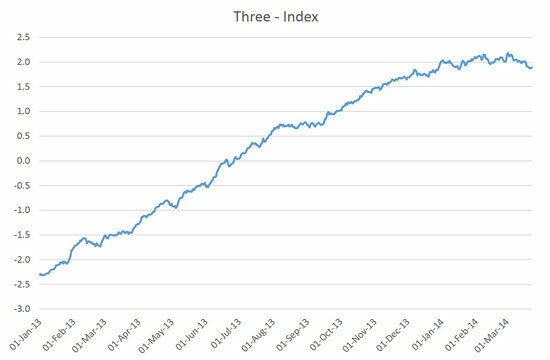 BrandIndex data also shows that Attention to Three has declined slightly since last March (when it peaked at 10%) standing at 6% on 24th March 2014 following the #Singitkitty advert launch. Despite this, BrandIndex data indicates that the campaign has been a success. 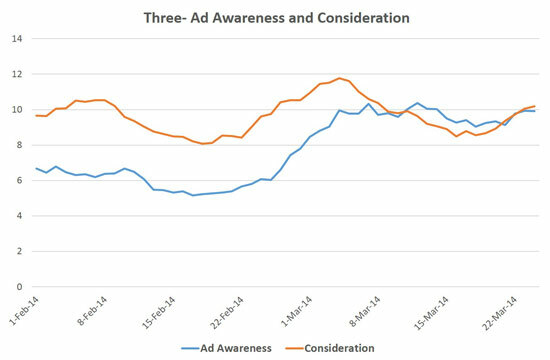 Advertising Awareness has almost doubled since it launched, standing at 10% as of 24th March, whilst Consideration for Three increased by up to 3% since the campaign started. Three’s recent decision to abolish charges for 0800 calls, and the accompanying advertising campaign, also led to uplifts in Ad Awareness and Consideration from 18th March. Dial Testing by YouGov shows that 73% of people liked the new advert. Those over 35 were particularly keen on it with 45% saying they loved the ad compared to 28% 18-34s. However, the results also suggest that last year’s #Danceponydance advert commanded a greater level of viewer engagement (between 2-5% more) than the #Singitkitty advert. 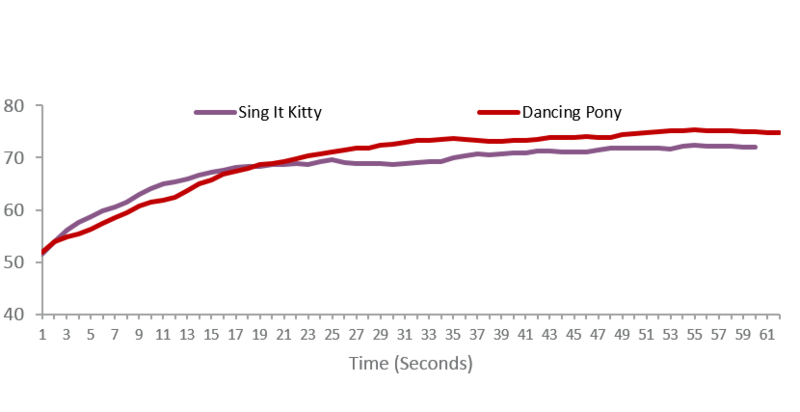 BrandIndex data also shows that Attention to Three has declined slightly since last March (when it peaked at 10%) standing at 6% on 24th March 2014 following the #Singitkitty advert launch. 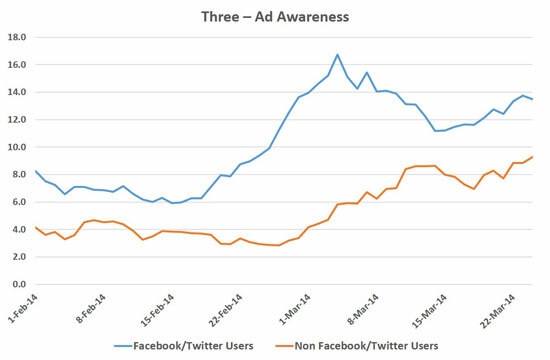 YouGov’s BrandIndex also shows that those who use Twitter and Facebook have a higher level of Ad Awareness - up to three times higher - than those who do not use these social networking sites. This suggests the use of a hashtag in television adverts, and Three’s social media presence in general, have been important to the success of the campaign. All of this is good news for the brand. The brand’s overall health (Index) score has been on an upward trend over the last year and, with the success of their latest campaign, shows no signs of stopping.